Nothosaurs were a group of marine reptiles that evolved during the Triassic period at went extinct at the end of that period. 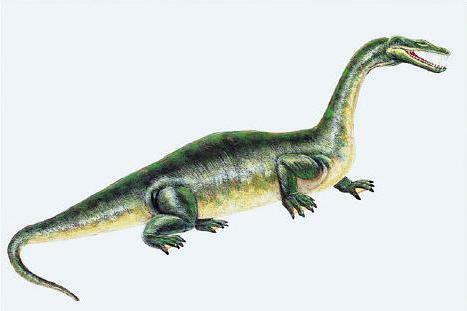 It is believed that Plesiosaurs, evolved from Nothosaurs, or Nothosaur-like animals. There were two main types of Nothosaurs (that today taxonomists classify into separate suborders), namely Pachypleurosaurs which were tiny and primitive, and true Nothosaurs, which were on average about 10 feet (3 meters) in length. Nothosaurs had paddle-like feet, which were probably webbed, a fairly long neck, and flat elongated head containing jaws filled with sharp outward pointing teeth. This tends to suggest that lived a similar lifestyle to modern seals, catching food in the water (Nothosaur jaws suggest that their diet primarily consisted of fish), but coming ashore from time-to-time as well.